This wine holder with its cube shape can hold 4 wine bottles. Can be freestanding or stacked for an interesting modern look. 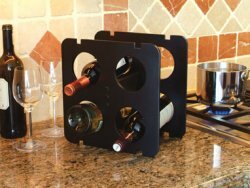 Wine cube holder measuers 11" wide x 12" tall. When wine bottles are inserted please allow 13-14" of depth.